To deliver high quality products, designers are often challenged at every stage of product design and development before achieving a fully developed design. With growing regulatory compliances, increasing customers’ demands and rapidly changing technology, it has becomes difficult for the manufacturers to maintain the competitive edge. Working under constant pressure of meeting the threshold quality level to stay as the market leaders; designers have already adopted the 3D CAD modeling means for easy documentation of digitized designs and accommodating the changes. However, the monetary and time bound challenges still prevail, when it comes to optimizing these modeled designs before manufacturing begins. 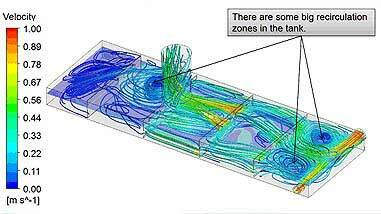 Computational Fluid Dynamics – CFD analysis is one such tool that aids the designers in taking calculated decisions and manufacturers to maintain the profitability. Performing analysis with mathematical models and equations for fluid flow in and around the model component through CFD software such as ANSYS and likes; deliver the real-time effects on the component without extra financial investment. To brief the benefits, it is important to brush up the fact that Cision reported about Ilmor’s CFD capability. It says that the enhanced CFD approach reduced the design development time by half and eliminated about three quarters of the prototype building costs for its project in 2016 of engine design development of Indycar. With newer CFD approaches and enhanced software tool capabilities, the feature that automates the mesh at runtime, which was once thought to be impractical, is today in practice. It drastically reduces the time for calculations of fluid flow for analysis and correlation errors. Such analysis allows the designer to forestall the hazardous effects arising due to safety risks by validating design safety based on internationally accepted standards. Moreover, designs can essentially be tested for the geometric dimensions, deficiencies can be located and critical sections can be pinpointed accurately, thereby developing design insights for the engineer. The level of detailing of designs and its effects is unlimited; more the details available as inputs, more accurate are the analysis results. 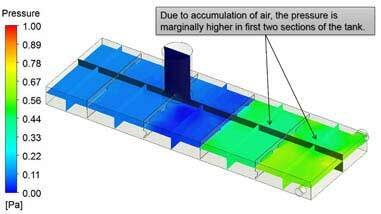 During the CFD analysis of air flow in the storage oil tank, simulations through CFD in ANSYS Fluent 14 pointed the possibility of vapor entrapment and through modifications in designs hazardous situations could be avoided. In addition to this, the CAD models developed to study the flow eliminated the performance of physical tests on a prototype and number of iteration associated with it. Collectively, all this led to reduction in overall time needed for design evolution and manufacturing costs of baffles to obtain an optimized flow. Meeting the timeframe of projects, cost effective solutions and being able to take charge of product safety being some of the essentials of maintaining the market value, manufacturers have resorted to CFD analysis to make the most of their products. With several other instances sufficing the credentials of CFD to benefit the manufacturers and designers in terms of business viewpoint, it is indeed a tool aiding designers and manufacturers to maintain the competitive edge.